If DeAnn Poe worked anywhere else, she’d be her company’s target customer. As the head of marketing operations, she runs all of marketing’s behind-the-scenes activities. Stacking different technologies to execute, enhance, and measure campaigns, she’s the definition of a modern marketer. Researchers also gather intel on topics like an organization’s projects, content consumption, and personnel changes. By refreshing its information every 60 days, the company provides sales and marketing professionals “a living and breathing data engine” to fuel prospecting efforts. DiscoverOrg’s identity is built around growth, both for its customers and for itself. Six times, it’s been on the Inc. 5000 List of America’s Fastest-Growing Companies. To get back on track, the company began a major effort to reform its pipeline. One of its major goals was to get better insight on what actually worked. As a first step, DiscoverOrg chose Salesforce as its single source of truth “since every department had access to the platform and so much of our data lived in that system.” Then, DiscoverOrg sought out a key addition to its technology stack. The results of the Full Circle Insights integration speak for themselves – and DeAnn speaks for the results. DiscoverOrg is committed to continued growth – and so is DeAnn. 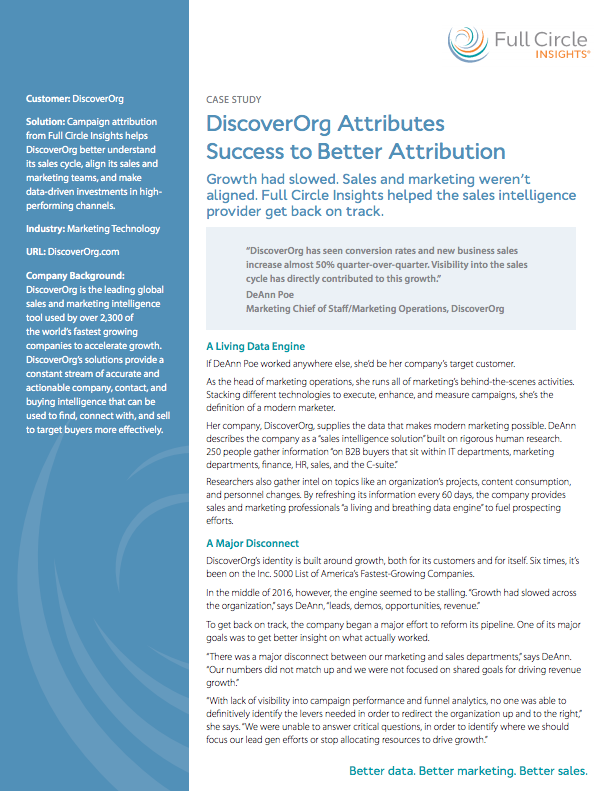 Download the full DiscoverOrg Case Study to learn how they saw conversion rates and new business sales increase almost 50%.